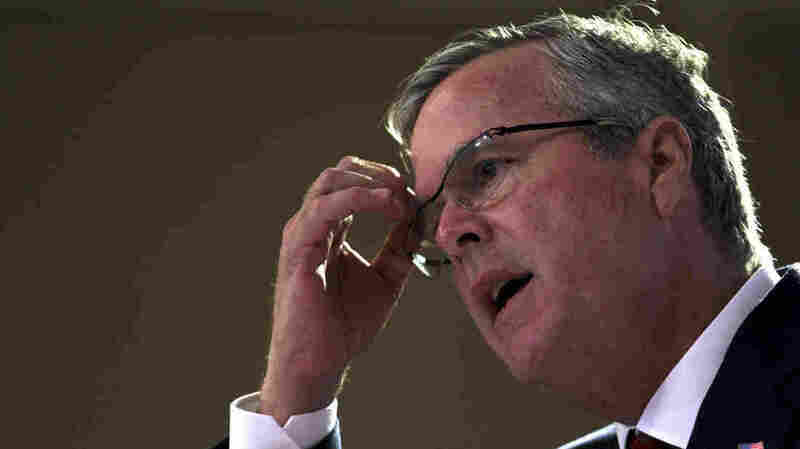 Jeb Bush Backtracks On Iraq, Says He 'Interpreted The Question Wrong, I Guess' : It's All Politics Jeb Bush is walking back comments he made on Iraq that he would have authorized the invasion even knowing what we know now. But he later said he actually doesn't know what he would have done. Jeb Bush continues to struggle to articulate a position on Iraq and separate himself from his brother's most unpopular policy. Jeb Bush is walking back an answer on the Iraq war, in which he had said he would have authorized the invasion — even knowing what we know now. "I interpreted the question wrong, I guess," he told conservative Sean Hannity on Hannity's radio show Tuesday afternoon. "I was talking about given what people knew then, would you have done it, rather than knowing what we know now. And knowing what we know now, you know, clearly there were mistakes." Still, Bush did not say the invasion was a "mistake," or that he would not have authorized it. "I don't know what that decision would have been, that's a hypothetical," Bush said, given the chance to try again. "The simple fact is mistakes were made. ... And so we need to learn from the past to make sure we're strong and secure going forward." On Monday, Fox's Megyn Kelly asked Bush, "Knowing what we know now, would you have authorized the invasion?" "I would have," Bush answered, "and so would have Hillary Clinton. just to remind everybody. And so would have just about everybody that was confronted with the intelligence that they got." Bush's reference to Hillary Clinton was because of her 2002 vote in the U.S. Senate to authorize the use of force in Iraq. Ultimately, Saddam Hussein did not have the weapons of mass destruction the White House and intelligence reports claimed. Clinton, unlike Bush, has since said her vote was a "mistake." In the interview with Kelly, Bush also stressed that he and his brother both acknowledge mistakes in how the mission was carried out. "Yeah, I mean so, just newsflash for the world," Bush said, "if they're trying to find places where there's space between me and my brother, this may not be one of those." Bush's vacillation on Iraq underscores just how tricky this subject is for him. The Iraq war remains very unpopular. An October 2014, NBC/Wall Street Journal poll found 66 percent of Americans say the war wasn't worth it. But Republican Strategist Rich Galen says that number doesn't take into account more recent foreign policy worries that people have — under a Democratic president. "I mean, people are reading everyday about ISIS and Iran," Galen said, "and it's a different time and place, and we're looking at different issues." And he noted that Election Day 2016 is still a long way off. "I'm not sure that it matters one way or another 18 months away," Galen argued. "We'll see what else is on peoples minds at the time." Of course, while Obama's approval ratings, particularly on foreign policy, have suffered in the past couple of years, his ratings are still higher than George W. Bush's at the same point in his presidency. Obama's approval in Gallup's polling this month was 47 percent. In May 2007, Bush's was 34 percent and plummeting, eventually bottoming out at 25 percent after the Lehman Brothers collapse before the 2008 election. Democratic pollster Peter Hart was blunt. "Iraq has such a strong stench in terms of the American public," Hart said. "It is a sense that we made huge mistake, and we were afraid to admit it." Hart adds that at this very early stage of the campaign people are still getting to know Jeb Bush. They think of him as a Bush first, which brings with it a lot of history. "And the challenge for Jeb Bush is to establish his credentials rather than getting caught and enmeshed in his brothers administration," Hart said. That's clearly something Bush knows as he tours the country in advance of his expected announcement. In public appearances he talks about his family. He says how proud he is of both presidents Bush, his father and his brother. But, he added in a February speech in Chicago, "I'm my own man, and my views are shaped by my own thinking and my own experiences." George W. Bush acknowledged at a private event last month that he is one of his brother's biggest problems when it comes to the campaign. He added that he'll help by laying low. But that won't stop the questions, and the onus will be on Jeb Bush to show how he'd be different.